People who weren’t around or who were too young to remember Cleveland in the ’70s and ’80s might wonder why anyone would make a fuss over a mundane “guyzone” station like WMMS, with its bland commercial hard rock and its focus on sports and hot babes — appealing to a specific group of males under 30. Today, five people who were pivotal in creating the WMMS legend spoke at the Rock and Roll Hall of Fame and Museum about what made the station so dominant in Cleveland and so influential nationwide — and speculated on whether that influence and dominance could be replicated in today’s very different music and media climate. Rock Hall vice president Jim Henke moderated the panel which included Billy Bass, the station’s first on-air star and music director who laid the groundwork for what the station would become; Denny Sanders, its evening air personality and behind-the-scenes guide; John Gorman, the hyper-competitive program director who took the station to the top of the ratings; Gaye Ramstrom, longtime station sales rep; and Walt Tiburski, whose 45 years in radio management included lengthy stints at both WMMS and WNCX. Bass took the audience of about 50 — which included a couple of additional WMMS legends, sales rep and “Get Down” man Murray Saul and T-Shirt mogul Daddy Dan Gray — through the station’s earliest days when it was fighting to exist on the then-obscure FM dial (Ramstrom interjected, “We used to say FM stood for ‘Find Me”) by cobbling together the various local counterculture players and playing a savvy mix of cutting edge and important music. Sanders, who arrived at the station in October 1971, related how new owners wanted to change the format in late 1972 and how they were persuaded to give the fledgling station a year to show some ratings movement. Sanders then brought his friend Gorman in from Boston in 1973. By the end of that year, the station was causing enough reaction in the market to convince the owners to let it live. He talked about a strategy born of necessity that laid the groundwork for the station’s eventual broad reach. “We were doing merchandising, branding, promotions, without knowing those terms,” said Tibuski. That strategy of blanketing the market eventually created a broad audience for the station. In working with everyone from the Cleveland Browns to the Cleveland Ballet to the Rib Cookoff, it created a sense that if you weren’t listening to WMMS, you were out of the loop — regardless of age, gender or interests. Hiring cheap talent out of local colleges, Gorman and Sanders put together the “family” that created a station that, once FM penetration had reached critical mass by the mid ’70s, never relinquished its market dominance until the late ’80s. Sanders pointed out that one of the most significant aspects of the station’s reputation as a breaking market for artists like Rush, Bruce Springsteen, and Todd Rundgren was to find a balance between the new and the familiar. Gorman suggested that the station’s reputation for picking the right acts to back had to do with soliciting input from multiple staff ears. He said they asked record label reps to give them albums for each DJ, thinking that what one person might not hear another would. Gorman related one of several stories that illustrated how WMMS combined determination and persistence with an uncanny knack for recognizing elements in the culture and happy accidents that could play into what they were doing. Gorman had already decided on the buzzard as the station’s “mascot” — still used to this day. But he had no artist. Then the station received a letter from a listener written as an illustrated comic strip. It had only a first name and a street name. Through diligent detective work, they tracked down David Helton. 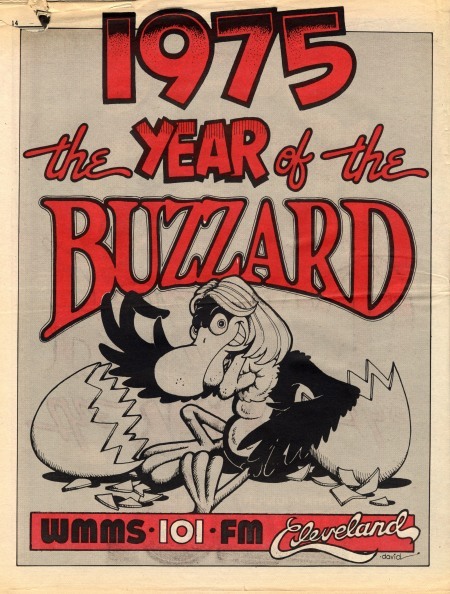 He drew the buzzard for nearly 20 years and created the distinctive look of the station’s promotion and advertising. The panel members had differing opinions on whether a station like the old WMMS could exist today. But both Gorman and Sanders were more optimistic, both suggesting any such station in the future would indeed have to maximize multiple media platforms.